There’s a reason it starts with the letter “F”, that’s what you’re getting! Are you spending more for an item to get free shipping? The answer is most likely YES! The saying that there are no free things in life is true when it comes to free shipping. Shipping is a real cost that MUST be added into the product price. When you buy multiple items from a website that offers “free” shipping, the shipping cost is built into EVERY item. In most cases when you tally up the total with “free” shipping, it will cost you more than a site that charges shipping and handling up front. Let’s look at some popular sites that give you “free” shipping and PulseTV.com that actually charges shipping. PulseTV Price is $29.99 PLUS shipping, for an average price shipped in the US of $36.90. Slightly higher… HOWEVER… buy two from Amazon and your price was $70.00. From PulseTV you get a $10 discount for buying two so it’s $49.98 plus shipping for a total of $58.97. Add more items at Amazon and your so-called Free shipping gets more expensive, while at sites like PulseTV.com that charge shipping, your price per piece shipped goes down. Because you are paying for the full shipping on EVERY item. You’re paying for multiple boxes even if they use one box. You’re paying labor as if every item is being boxed separately, plus your postage on sending one item is always more expensive than sending multiples. Sites like Amazon count on your buying multiple items to actually profit on their “free shipping”. While sites that charge for shipping are just trying to break even on all the costs. Sure it’s free shipping but let’s look at the PulseTV price that charges shipping. It’s $9.49 for the item… add shipping and handling the total comes to: $13.48. You’re saving right away. You will pay $29.95 and get “free” shipping. At PulseTV.com you’ll pay $24.99 plus shipping for a total of $31.46. Cheaper to buy on Amazon by a dollar or two… but here’s where the free shipping sites get you. PulseTV.com gives you a discount of $5 per jar when you buy two or more. So on two jars at Amazon you’re paying $59.90. At PulseTV.com you’re paying $39.98 + shipping of $6.77 for a total of $46.75. Pretty substantial savings to actually PAY for shipping. But guess what… the average person buys 3 jars, so let’s look at what free costs you. PulseTV.com $59.97 + shipping cost of $6.91 for a total of $66.68. WOW! If you got free shipping you just paid $23.17 MORE. Notice how little the shipping went up from 2 to 3 jars. From $6.77 to $6.91. Almost any site that “gives” free shipping is selling you a bunch of baloney. Remember free starts with “F” and that’s what they’re doing to you. Granted if you are just going to buy one item, maybe you’ll save a dollar or two, but when you combine products you’re taking money OUT of your pocket. At PulseTV.com we want to save YOU the maximum amount of money so we do a few things. We give you discounts on most items when you buy multiples. We increase shipping based on weight and your location only. We only fold in the labor and packing costs on your first item. The average PulseTV.com customer purchases 4 items per order. Looking at the examples given above look how much more you would be paying for a total order buy getting FREE shipping. From “Shagmail” to “Gophercentral”: Did you know PulseTV also offers free eZines? If we were to take a look back 22 years at a little suburb of Chicago, IL we would find the roots of what would become one of the biggest email newsletter networks on the Internet. All the way back then it was called “Shagmail”. We can thank a popular James Bond spoof film which came out that year for that. At that time email was exploding. AOL was mailing out free trial discs by the millions and the general public was just discovering the convenience and immediacy that email provided. In the 90s, PulseTV.com was selling videos via direct response television advertising and they began collecting customer email addresses along with all of the normal contact and billing information as a matter of course. That was the original email list, and it didn’t take long to discover that people loved getting email and were very responsive to email advertising. The next step was a no-brainer; provide content people want to read in their email and they will be more likely to open it and look at ads. Shagmail.com started with about 10 email magazines, or eZines. Titles like the clean joke list Clean Laffs, the adult joke list Laff-a-Day, the home-cooking column Daily Recipe, and Bizarre News were all written and published in-house by PulseTV staff. As the popularity increased so did the number of titles. Shagmail was adding content as diverse as a professional wrestling review and a daily Bible verse, among many others. With a dramatically growing audience the decision was made to re-brand Shagmail with a somewhat more inclusive name; GopherCentral. Eventually GopherCentral.com included a catalog of nearly 80 email publications with millions of unique subscribers. It was even being mention on radio and national television. But the Internet being what it is, within a few short years fatigue began to set in and the momentum began to slow, especially after the dot-com bubble collapse in the early 2000s. Despite this GopherCentral.com was still a juggernaut and had a huge presence for years to come. These days GopherCentral.com is more of an email boutique than a superstore. The most popular publications are still there, with a core audience of fans who forward their favorite issues around to their friends and still patronize PulseTV.com. Now GopherCentral.com is starting to grow a social media presence as well. If you have never read a GopherCentral.com eZine they are all free, like they have always been, and the editors are just waiting to say hello. You can’t turn on the television without seeing an As Seen on TV commercial for some kind of copper thing! There are pans, knives, even socks utilizing this latest trend. We love em all! So much so, that we created a special new department with all our best-selling copper-related products: we call it the Copper Corner! Copper cookware pans are the latest in ceramic non-stick technology. If you want to start small, we have a traditional 9.5in pan, all the way up to our deluxe 4pc square copper pan set with deep fry basket. The As Seen On TV deep square copper pans go by the name of Gotham Steel, Red Copper, or Copper Chef. Ours is just as good, but made even better since it’s only a fraction of the high TV prices! 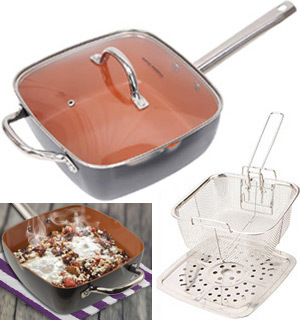 We carry a 4pc set: you get the pan, the lid, steamer tray AND an awesome fry basket. To complete your copper kitchen, we also feature the ever-sharp copper knife. 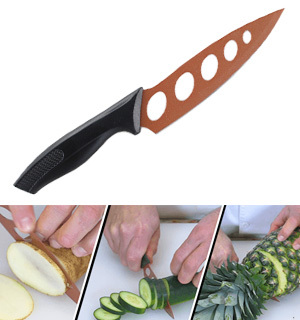 This IS the official As Seen on TV copper knife – and we’ve got a crazy low price on this one. Non-stick coating and super sharp steel never needs sharpening, so your food prep is a breeze. Can handle chopping as well as delicate tomato slicing like a pro! It’s not just for the kitchen though! 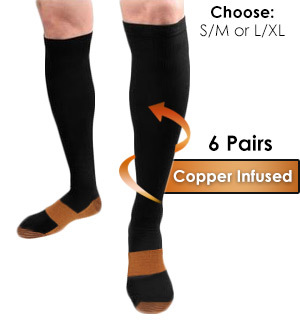 We also have some copper-infused compression socks. Why copper? The super fine fibers actually cut down on foot odor. Choose between knee-high socks and ankle socks that promote good circulation and reduce swelling. We also have copper-colored outdoor lights, Moscow mule mugs, and more in our Copper Corner to round out our favorite new element, so we’ll Cu there! Copper’s Elemental Symbol is Cu! 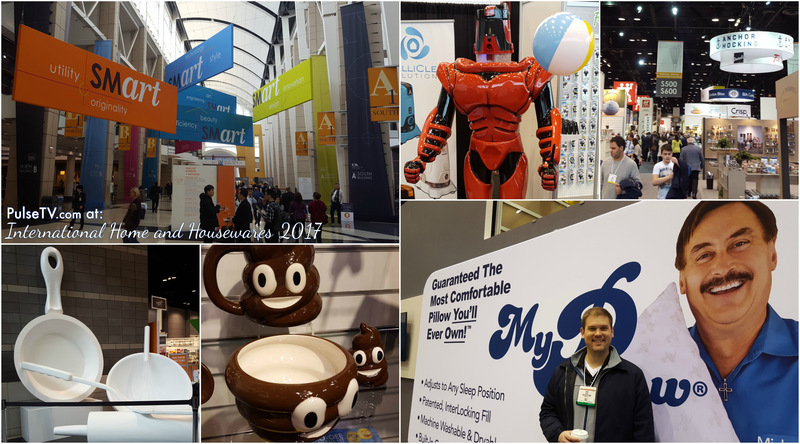 There were a TON of awesome products we saw at the International Home and Housewares show. It’s one of our favorite shows to go to – and it doesn’t hurt that it’s practically hosted in our backyard – McCormick Place in Chicago! So we wouldn’t miss one of these for the world. Besides watching some cooking demos from our favorite chefs, sampling delicious snacks and smoothies, we actually got some real work done too! We met with some awesome new vendors, some Shark Tank successful companies, and current vendors/friends. It was an exciting trade show to be at, and we found plenty of awesome new products. Took plenty of pictures, and we’ll start sharing some of our upcoming products on our Facebook Page. So make sure you like our page and are subscribed to get the latest info on your newsfeed as explained below! Make sure you get all our updates on Facebook! We don’t usually like to brag, but 2016 was an exciting year over here at PulseTV.com! It was our 20th Anniversary as a company, and one of our most fun years ever as an ecommerce company. As a top online retailer, we want to thank all our customers and fans for sticking with us, watching our videos, and shopping on our site! We gathered some data and complied it all into a infographic… Take a look! Khalil’s Battlestation post made me think about all the PulseTV commodities that I’ve purchased the past 4 years of being part of the Pulse Squad. I looked around my space and thought — what makes my area function for the many, many hours that I spend plugging away here at PTV? I started off here as a Customer Service Representative, then turned into an Operations Team Member. I’m still mostly a mom at heart, so my desk is caked with Pulse products and personal reminders of the little things that keep me going. This is another possible PulseTV product in the works of being researched and discussed. We’re currently selling a more inexpensive tracker — it’s cheaper since it lacks all the bells and whistles of this Modern Fitness model. I’m holding onto this sample since I volunteered to test and check out the app if we decide to pick it up. During my first week here at PTV I was [randomly] asked, “So when are you going to personalize your desk?” I snuck out that very day on my lunch break to Target and picked up this pretty pen holder. I filled it with the cliché pink and purple pens that you may expect to find on a woman’s desk, as well as other sporadically used desk supplies. Nothing special, but I look forward to having the same flowery pen holder 20 years from now on my desk as a reminder of how far I’ve come! If you’ve known me for any time at all, you’ve probably heard that I love foxes. Secret Santa (Sharif!) gifted me my Fancy Fox last Christmas, and it makes me smile. My foxed-up Sip by S’well Stainless Steel tumbler keeps my water super cold. Since I’m four-eyed and a sunglasses enthusiast, I use Smitty’s Glasswax on the regular. I pretty much consider this the PulseTV-community Smitty’s — my coworkers roll up to borrow my glass cleaner on a daily basis for their glasses or smart phone. A little bit goes along way, so this tube has lasted me about a year. Khalil mentioned this Monitor Stand in his read and I have one too! I like it mainly because it looks clean, helps with posture, and holds the other things that don’t really have a distinct place on my desk. My USB fan is plugged right in as well as my House of Marley Earbuds. I also like that my keyboard fits right under it at the end of the day. Clutter is not welcome here! You guys: this is the best power bank ever (IMO). Khalil actually recommended it before my New York trip in January! I knew I would be out and about taking pictures the entire time with limited access to a power outlet, so I asked the guy, which power bank won’t let me down? I got 3, that’s right, 3 charges with my iPhone 7 up to 100%. And there was juice to spare! We sold a ton of different battery backups, but I think this one has the most power — 10,000mAh (whatever that means). It’s still sitting on my desk because I brought it back and charged it right back up, ready for me to throw in my purse the next time I need it. My daily responsibilities are geared towards daily operations now but I can’t forget my PulseTV roots — Customer Service. I cannot express how important a comfortable ear piece is when my primary job was to help customers 8 hours a day. I still help with CS overflow, but it also comes in handy during my long talks with our fulfillment center. Over time, the amount of desktop personal memorabilia has fluctuated but my current family photos are pretty simplistic these days. Sweet photos of my husband, daughters and puppers gives my eyes a break from my computer screen. Our office is hot (understatement). I keep my house at a firm 68 degrees year round, so when it starts creeping above 70 degrees here at PTV HQ, the fan goes on. We sold these long ago — and it would not surprise me to find many of my team members with one on their desk for the very same reason I do! This mirror is another PulseTV product that gets daily use. Actually, Ashley from customer service snatched it up before me. After I kept stealing hers, she kindly gifted one to me! Since then, coworkers all around the office keep borrowing it for touching up makeup — and getting spinach out of their teeth! I like that my station is a mixture of personal touches as well neat finds by the PTV buying team. A lot of our customers tell us that they love the things we pick up; that they can’t find them anywhere else with our deals. Imagine working here surrounded by the influx of cool products we get in daily! Just when I pay off my personal balance, I rack it right back up again. This is just the stuff that I keep at my desk, but don’t ask my husband where I keep all the stuff I bought for my home. If you’ve never heard the term battlestation used in an office setting, don’t feel too left out. All it refers to is the gadgets, setup, and area you put your computer. I’m certainly not in a position to post to reddit’s /r/battlestations since my rig isn’t nearly as fancy (and I’m not really a techy guy when it comes to computers). Heck they’d laugh me out of the place for simply using a Mac. But I wanted to share my setup here at the PulseTV office. I’m Khalil, and I spend most of the day Photoshopping, video editing, and researching new products as a buyer. 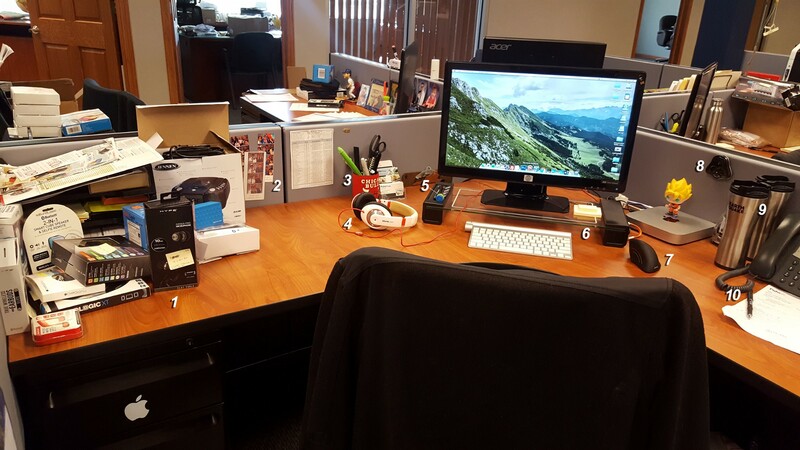 I consider myself organized, but this part of the desk gets a pass from the neat freak in me. It’s a collection of samples I’m evaluating, stuff that’s coming in soon, and stuff waiting for a video. I need to shoot that Jensen boombox one sometime this week, so I’m making sure I know how to use it before Zack and Anisa get a hold of it. I tested some new earbuds and speakers that I can’t wait to get in stock! Some of these samples and open products wind up in our Box O’ Junk, among other goodies. These are all from Zack’s wedding! Fun times with the rest of the PulseTV gang. I’ve had this same pair for 4 years at the office for one reason: it still sounds great. They’re loud, deliver excellent bass and remind me why I love SoundLogic products. Constant use while video editing started wearing them down, so I replaced the ear pads, taped the microphone after it broke open one day, and reenforced plastic seams with some of our Rapid Fix Plastic Adhesive. I hope it lasts another 4 years, I’ve really gotten used to its sound profile. We went to the Consumer Electronics Show (CES) in Vegas this year in searching for new tech products, and I snagged this 3D-printed nut and bolt from Makerbot. I fidget around with it while I’m rendering a video or something — it’s therapeutically fun! While we didn’t wind up purchasing any 3D printers we picked up a few cool things like the Universal Phone Holster by Ghostek. We sold this item a while ago, and plenty of my coworkers also picked one up for their desks before it sold out. It’s great for organization — I slide my keyboard under it when I leave for the day, and there’s a nice tray for all the SD cards I need. The built-in speakers let me crank up the volume for the debut of each new product video. Like I said, I’m constantly in Photoshop making digital ads, product photos, and web elements, and video editing for an hour or two at a time. This is the most comfortable mouse I’ve used (and a steal at $20!) but I admit it took some time getting used to it. The mouse usually baffles anyone popping over to use my desk, but I am the only Mac user in the office, so people usually stay away. One of my favorite personal orders from our own site: Stainless Steel Earthquake Mugs. They were an As Seen on TV product that has a suction cup on the bottom that prevents spills if you accidentally bump it around. I have complete confidence in them being directly next to my computer, phone, keyboard or anything — you cannot knock them over! I wish we still had them in stock, I bought a bunch as gifts last Christmas. I bought two so I can keep my cold water in one, and have another for hot tea or cocoa. 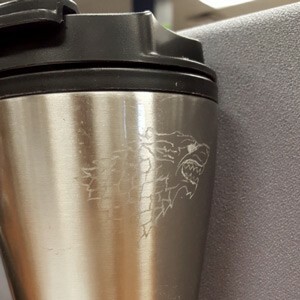 The mugs are differentiated with an etched Game of Thrones Direwolf using one of our old engraving pens we sold. I’m not kidding, I love this pen! I got it from our old pound of pens deal. We used to sell a pound’s worth of junk pens (misprints, overstock, miscellaneous stock) and sent them out. I snagged a few, but this one writes like a dream. 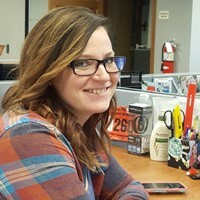 The pen has information for CKLQ 880: Manitoba’s Country Hits Radio Station. I can’t believe it found its way here in Tinley Park! So that’s it for the virtual tour of my desk. Just wanted to show it off and talk about some of our cool stuff — we really stand behind everything we sell, and it shows when we buy it for ourselves! I also have a TON of things sitting around my apartment, but that’s for another blog post. Before the sun set on the summer, PulseTV made sure to enjoy America’s pastime. 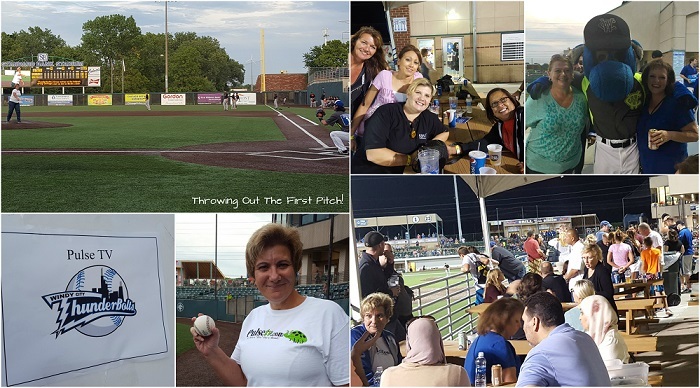 We made our way to watch the Windy City Thunderbolts take on the Schaumburg Boomers; and Anisa had the honor of throwing out the first pitch. She’s got an arm! Our time at the ballpark was definitely a Home Run! And The Thunderbolts won 6-1! Are you ready for this? 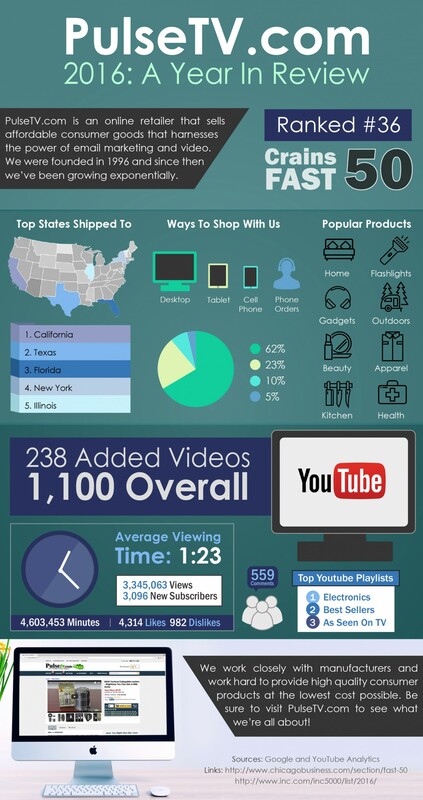 PulseTV has recently made a huge milestone with the creation of our 1,000th product video. We can’t believe it either! One might wonder how we have managed to go from selling VHS and DVDs in catalogs and TV commercials to producing our very own, in-house product videos. Learn about what led us to making our very first video, finding our voice and ultimately why we do it. Gearing up for the holidays. For the rest of the world, the big holidays including Christmas are still months off, but for retailers Christmas is right around the corner. Here at PulseTV.com we have already started gearing up for the fourth quarter. In the last couple months we have sent our team of buyers to the big ASD consumer trade show in Las Vegas, the Consumer Electronics show, also in Vegas, and our own local show, the TMC Merchandise Show in Rosemont, Illinois. And they discovered some great products we are really excited to introduce to our customers. We have had tremendous success with the Streak Free Cloths we have been carrying for years, and we have found something we hope is going to be just as big. They are called ‘Dura-Fresh’ cloths and they are made from natural wood fiber. That makes them completely natural, non-toxic and even compostable, but the great thing is that simply rinsing them in hot tap water eliminates 99.9 percent of germs and bacteria. That makes them perfect for use in the kitchen for clean up or as dish cloths. We also found something we think is going to be a hit with homeowners. It is a light up sign box. Basically it is an illuminated sign you can customize with a bunch of included letters, number and symbols. So you can put your address in the front window, or ‘PARTY ROUND BACK’, ‘WELCOME HOME’, or ‘HAPPY BIRTHDAY’. Anything you can think of. And we certainly haven’t forgotten about the kids. We found a really neat remote controlled truck that shoots bubbles. That’s right, a bubble truck (we’re going to try and come up with a better name for it). We really think kids are going to go nuts for it. These are just a few of the many great new products we will be introducing over the next couple of months. The fourth quarter is always the most exciting time of the year and we believe our customers are going to share our excitement when they see what we have found for them.